Sir is a stealth and survival game unlike any other, set on a mysterious archipelago generated procedurally by you, and therefore unique to each game you play. You can define your own islands, each one created in moments by our rather clever British Countryside Generator. These islands are then populated by a raving aristocracy of murderous robots, their robot hounds, and worse. You job is simply to survive, and get home. Permutation Racer’ is an experimental, endless racing game, exploring the procedural construction of space. It’s part of my PHD research to investigate ideas that connect games, permutation and the sublime. The race track is generated from a series of noise filtered ‘biome’ styling functions. There are about 12 region types ranging from chasms to archways and caves, all generated in real time as the player progresses. I might post a more technical article about the actual methods used later. The only aim is to travel as far as possible, hampered by the fact that over time/distance the generation algorithms make the track more hazardous and convoluted. 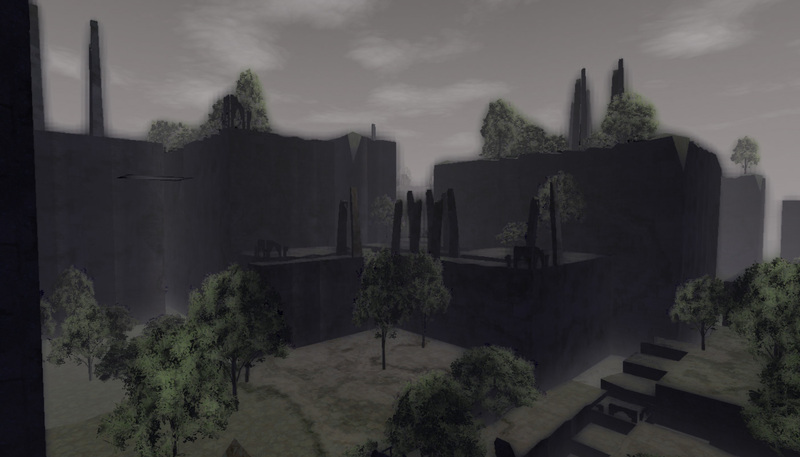 ‘In Ruins’ is an experimental, ambient game examining the procedural construction of space. It’s part of an ongoing Phd research project to investigate ideas that connect games, permutation and the sublime. It’s part of a series of games inspired by artistic interpretations of the sublime, in this case the work of Romantic landscape painters (Thomas Cole, Caspar David Friedrich etc). Its also heavily influenced by Fumito Uedas Ico series. The player is deposited on the edge of a procedurally generated island. The island consists of overgrown pathways ruined spires and broken ramparts. A central tower looms above the island beckoning the player towards it. AVSEQ is an audio-visual sequencer puzzle game. Connect falling atoms to unlock near-endless varieties of music at each stage. Every level of AVSEQ is a music sequencer with 2.2300745198530623×10^43 possible audio permutations, that’s 22 tredecillion in total!